The Sylvanian Families Shop! - Super Inky! I haven't written on my blog for a few weeks. That's because I've been busy traveling! I went to London, England for my aunt's wedding! 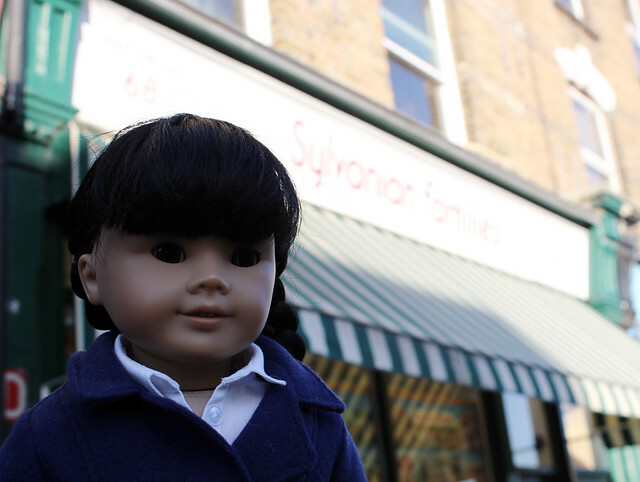 It was a lot of fun, but I think one of the more fun places I visited was the Sylvanian Families shop in Highbury. 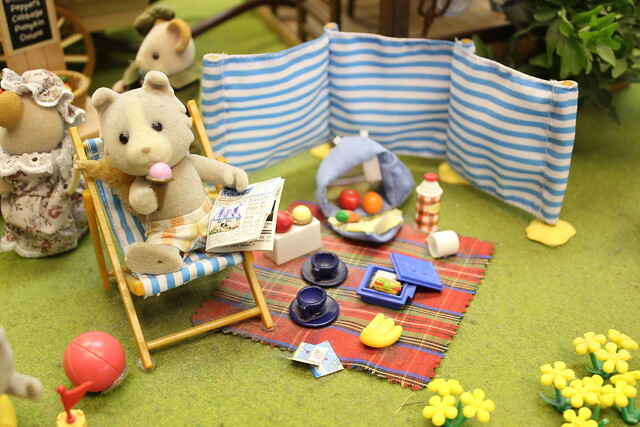 Sylvanians are little animal figurines that have entire little worlds of accessories to go with them. I have been into them for a few years- I usually get a few sets for special occasions like my birthday and New Year. (They are called Calico Critters in the United States.) 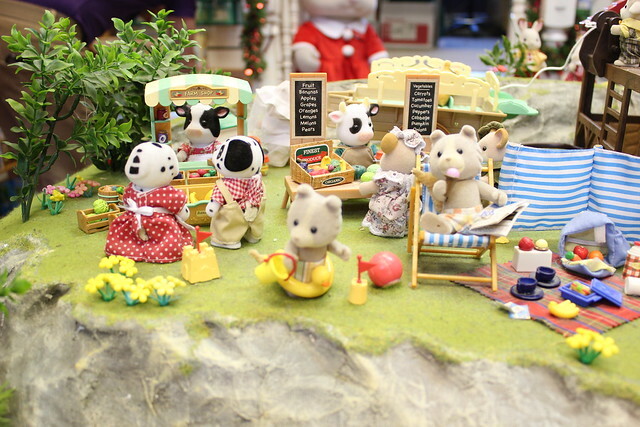 I really enjoyed the Sylvanian Families shop because the shopkeepers have arranged scenes all over the store. Isn't this scene cute? A little dog is having a picnic! The shop is pretty small, but it is packed to the brim with toys! I picked out several items, which I'll reveal in another blog post. I loved choosing what to bring home to New York City, but I had to be very selective because my suitcase was not that big. Here's another little scene- doesn't it look adorable? I really liked this hotel, but it was far too large to even attempt to bring home in my suitcase! It's even bigger than I am! Aren't the accessories cute? I love the phonograph! Before I left, I made sure my mama took my picture with Freya Chocolate, a "local celebrity." She was all dressed up for the holidays! The Sylvanian Families shop is a fabulous little store. If you are ever in London, don't forget to stop by and visit! In this entry I'm wearing: black boots from American Girl, coat by Royal Doll Boutique (from a pattern by Liberty Jane Clothing), and grey Undrabulous pants by Liberty Jane Clothing. Cool Inky! In 2012, my mom entered a name the koala family contest from calico critters, and got an honorable mention! It was cool because I get to play with all of moms critters! That's so cool!!! I entered the contest too, but I didn't win anything. Did you get a prize with your honorable mention? My Mother used to have some Sylvanian Families, but sold them last year because she had so many, and they took so long to set up that by the time you'd got them ready to play with, you barely had any time left before you had to pack them up again! I still really like them though. That is so sad that your mother sold the Sylvanians! But I agree, they do take a long time to set up. My parents are always complaining then when I play with mine, I concentrate so hard that I forget to do my chores and homework! Aw! The rabbits and bears are really cute! I like so many of the different families, but my moms say I can't can't get many more because they're starting to take over! 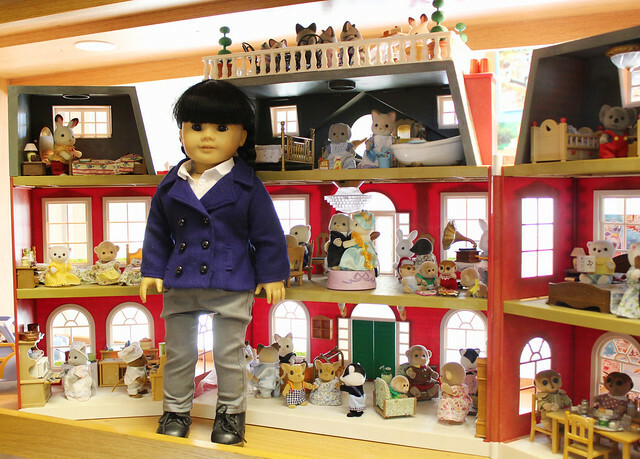 That Sylvanian Families shop looks so cool and almost like a museum, what with all of the elaborate scenes to look at. You are so lucky to have visited England! My parents took my sister and me to London when we were younger, but I haven't been since. I'd really like to go again. Hmm, the newest student at Fair Hollow is from England, I think...maybe I should go talk to her? 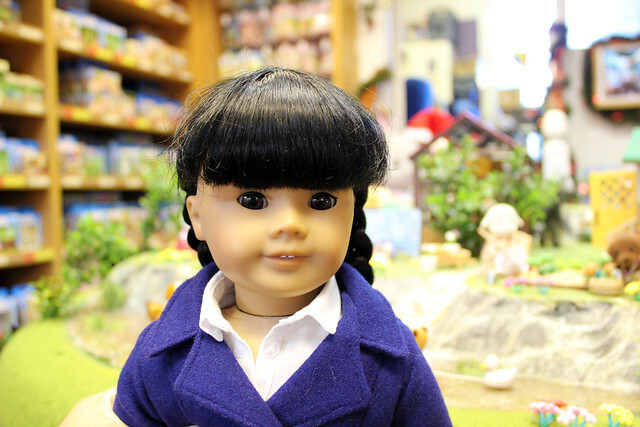 What did you buy in the Sylvanian Families shop? It was wonderful to visit London! I hope you will be able to go someday soon. I saw an ad for day trips to Paris on the Eurostar and begged to visit Juliette, but it was too expensive. Boo! At the shop, I bought some cute animals, outfits, and the Fish & Chips van! 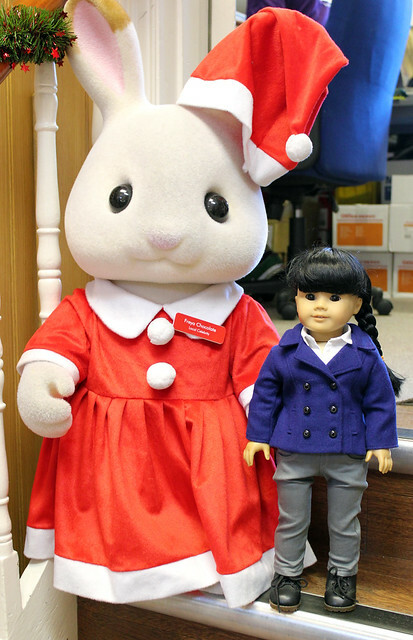 How awesome that you went to London, and were able to visit the Sylvanian Families shop while you were there! We love Calico Critters. They look adorable in little scenes! I love your picture with the big Freya Chocolate! Thank you for your compliments! I love Calico Critters too! Lucky! That store looks awesome. Hmm... I want that wedding set for my big person! Cassie, you should order it! The Sylvanian Families website does international orders!